A one-of-kind guide specifically for rehabilitation specialists! A leader in pharmacology and rehabilitation, Charles Ciccone, PT, PhD offers a concise, easy-to-access resource that delivers the drug information rehabilitation specialists need to know. 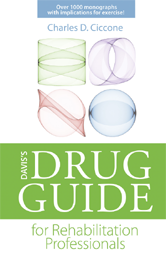 Organized alphabetically by generic name, over 800 drug monographs offer the most up-to-date information on drug indications, therapeutic effects, potential adverse reactions, and much more! A list of implications for physical therapy at the end of each monograph helps you provide the best possible care for your patients. Student resources available at DavisPlus (davisplus.fadavis.com).